April 23, 2014 by Trevor Raushi. On Friday, April 11th 2014, Syracuse University brought local high school students together on campus to celebrate the Day of Silence. The Day of Silence is an annual day of collaborative action to protest the bullying and harassment of lesbian, gay, bisexual, and transgender youth. 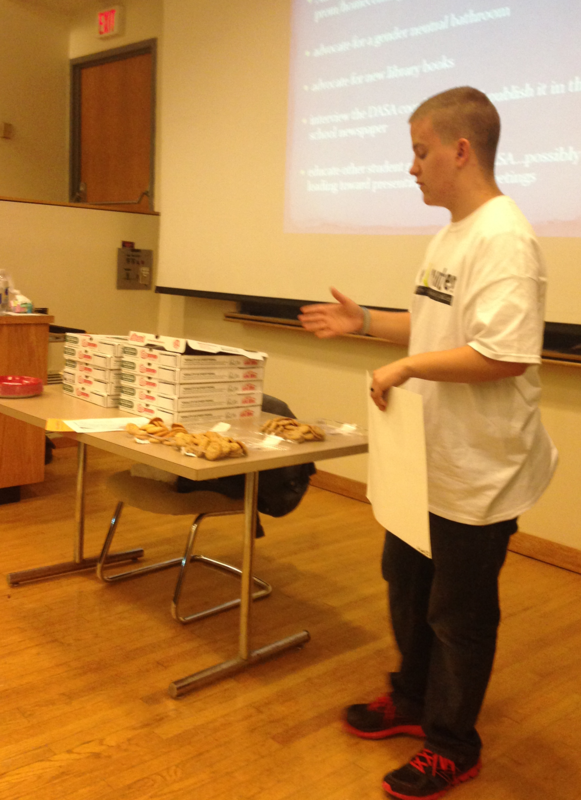 The Queering Education Research Institute (located in the School of Education on Syracuse campus) and the SU LGBT Resource Center host an event on campus each year where all local schools (staff, students, and parents) are invited to attend. As I have been working with QuERI throughout the past year, planning this year’s Day of Silence event was my main focus for the semester. This year we centered the event on the recently passed New York State anti-bullying legislation that the QuERI team had a large part in writing, the Dignity for All Students Act (DASA). DASA requires all public schools in New York State (K-12) to ensure a safe and productive social and learning environment for all students. DASA was the first of it’s kind because it specifically names transgender students as protected identities. One of the major requirements of DASA is that each public school building must have a trained Dignity Act Coordinator who is responsible (and mandated) to respond to any reports of bullying or harassment within the building. As this law is fairly recent, our goal for this year’s event was to educate students about some of the simple logistics of DASA, and encourage them to use the law to their advantage and for their own protection. 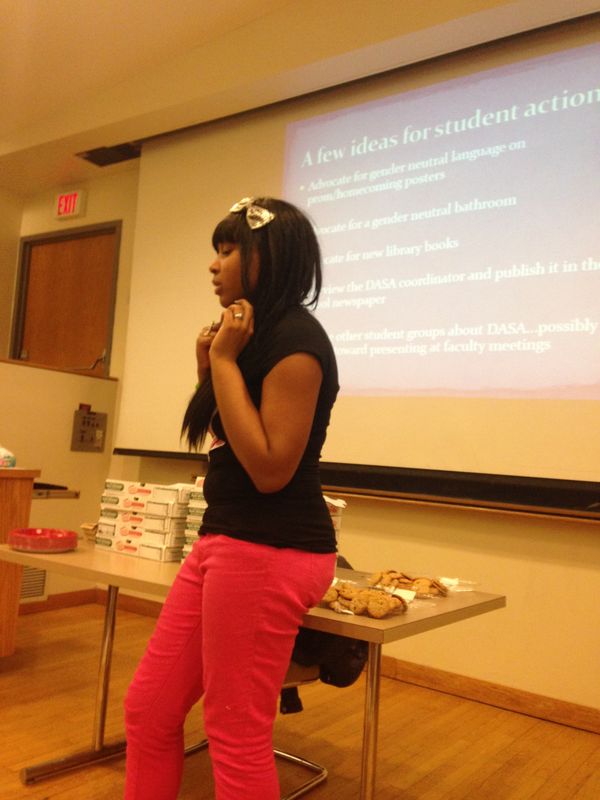 Many students are unaware of the rights they have and often don’t have the tools necessary to advocate for themselves, we hoped that by giving them DASA, students (particularly LGBTQ students), would feel more comfortable speaking up when they see or experience injustice and reaching out for help when they know they need it. 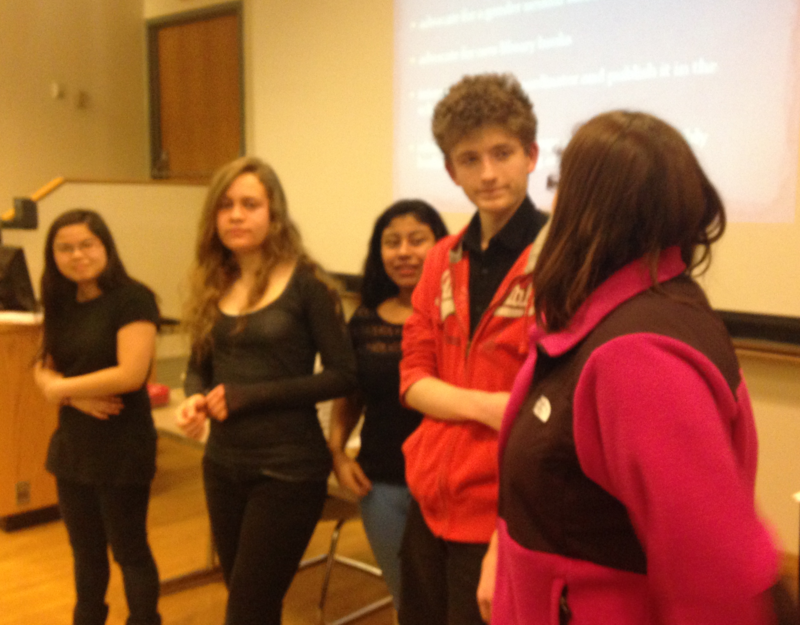 Several local high schools were represented at the event and students were eager to participate. 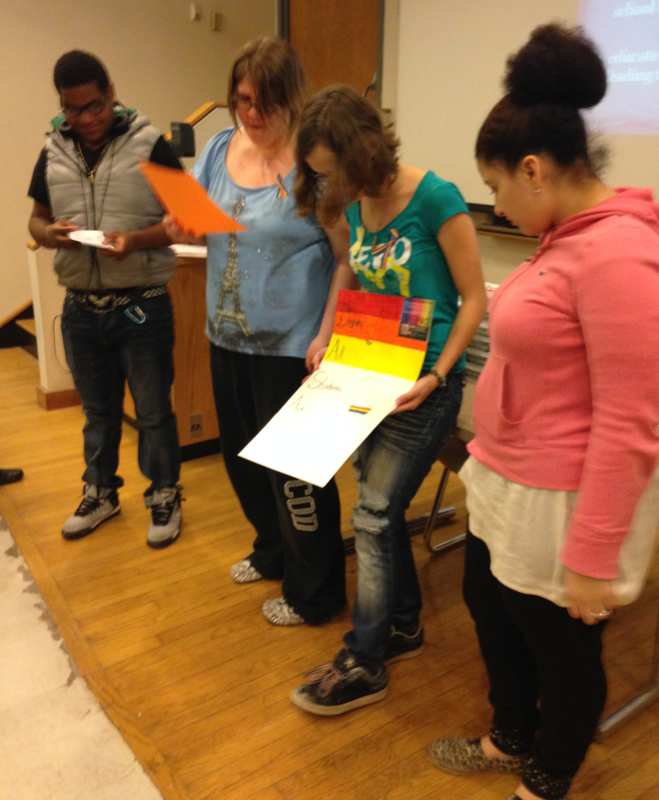 After gaining an understanding of the law, students in attendance were provided with “DASA Packets” full of materials that allowed them to create signs and artwork to advocate for equality, express their creativity, and promote the Dignity for All Students Act within their respective schools. I’m so grateful to have had the opportunity to work with Imagining America, QuERI, and to take courses in the Cultural Foundations of Education program. Each has really given me the opportunity to explore the importance and concepts of education, community, power, and change – and the special relationship they all share. As someone who grew up in Syracuse, went to school here, and is now enjoying the limitless possibilities of higher education in the same city, it was great to see students leave the Day of Silence event feeling educated and empowered. April 10, 2014 by Chris Borncamp. Being surrounded by creative, energetic, and motivated scholars is what separates Imagining America from other programs. Engagement Scholars have the resources, flexibility, and support to stimulate change, and promote sustainable development. As a scholar, I have met and worked with local leaders and educators who are committed to improving the quality of life and opportunities in Central New York. The best part of being an Engagement Scholar is the ability to explore and develop projects that you’re passionate about. Although Engagement Scholars work together for the same ideals that characterize SU’s vision of Scholarship in Action, each scholar has the freedom to work on their own projects, free of restrictions, with a great support team. The upcoming April Dear Syracuse billboard, featuring a quote from Michael Rotella ’11. Graduate student Quinton Fletchall loves narrative. He particularly loves the narrative of urban planning and social design. He sees cities as stories that people tell through the lens of hope, fear and dreams for the future. He also sees those stories as the foundation for how change happens over time, based on what people believe, design and build. He collects stories that reflect how people feel about the places they live. Now, he’s writing his own Syracuse stories, as he’s helping design the city he’s come to call home. Since coming to SU in 2008 from the Midwest, Fletchall has earned a bachelor’s degree in industrial design through the College of Visual and Performing Arts (2013) and started a graduate degree program in communication and rhetorical studies. As an Imagining America Engagement Scholar in SU’s Office of Community Engagement and Economic Development, he has used his expertise in design and love of working with people to launch several unique and popular civic engagement projects along the Connective Corridor, including a ’Cusescapes photography contest and “#Dear Syracuse, With Love” billboard, postcard and social media series. Those projects have gained notice as some of Syracuse’s first crowd-sourced public art projects. Fletchall has made the Connective Corridor bus easier and more enjoyable for students by designing a user guide, maps and on-board wayfinding signage, as well as rotating gallery shows on buses. He’s created wayfinding systems to help students explore downtown and plotted out historical walking and urban adventure trails to introduce SU students to the city he loves. His latest project will be unveiled in early April, “In Syracuse …,” an interactive window art project at the Landmark Theater along Jefferson Street that invites pedestrians to share personal experiences about what they enjoy and what they’d like to see change in the city. 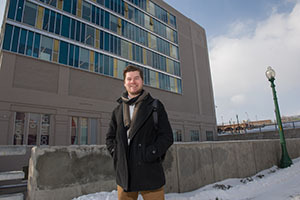 An enjoyable part of his role as an Engagement Scholar has been working with area businesses and nonprofits as part of the Connective Corridor façade program, which has reshaped 56 downtown properties along the streetscape. These public art projects have been funded through an Empire State Development grant through the Connective Corridor. Fletchall’s next community-based project will pay homage to Syracuse’s rich history and invite ideas for its future. Under the guidance of Connective Corridor Director Linda Dickerson Hartsock, Fletchall recently wrote a competitive grant that was chosen for funding by the Erie Canalway National Heritage Corridor. The $7,000 grant was given to create an interactive public art mural highlighting the Erie Canal and other civic projects that showcase innovation, civic infrastructure and creative placemaking in Syracuse. The Erie Canal Museum and the City of Syracuse are project collaborators, along with the Connective Corridor. The mural, called “Let Us Continue,” will be a panel affixed to the wall along the portion of the Creekwalk that runs along on the east side of the Nancy Cantor Warehouse, located at the corner of Fayette and West streets. Fletchall draws the theme from President Lyndon B. Johnson’s address to the nation following the assassination of President John F. Kennedy in 1963, when Johnson paid respect to the fallen leader by recognizing the work of his presidency, and encouraged the nation into a group effort to continue what Kennedy had started. Fletchall will construct the 65-foot mural in two parts. One part will include a graphic representation of the city’s history, including the Erie Canal and other civic projects, such as the construction of Route 81 (which is timely, given the current discussions on the future of the interstate). Fletchall is currently combing through the archives of the Erie Canal Museum, working with museum curator Daniel Ward, as well as other historical resources to construct this portion of the mural. The second part of the mural will be inspired by interactive projects in public spaces by artist Candy Chang, who encourages people to share their aspirations through public art (Syracuse’s version of her “Before I Die” wall is located on the side of the former Gear Factory at 200 S. Geddes St.). On this portion of the “Let Us Continue” mural, members of the community will be asked to share their vision for the city. Fletchall hopes that through this a collective public dialogue will emerge, and that voices will come from every population for which Syracuse is a place to live, work or play. “Public art has a very democratic side—if you can get to it, you can contribute to it,” he says. Fletchall expects to complete the mural in July. 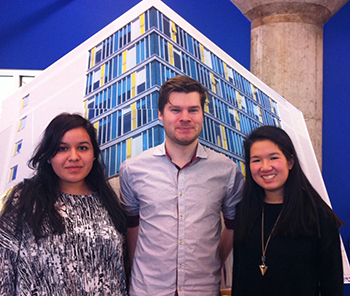 Fletchall with second-year industrial design students Karina Campos and Tiffany Soohoo, winners of a recent Connective Corridor design competition for interactive public art. The field of design has interested Fletchall since he was in school in his hometown of Oskaloosa, Iowa. He worked as a draftsman at a local architectural firm while in high school, completing architectural drawings based on the vision of the lead architect—including houses, offices, churches and car dealerships. While he was drawn to the process of design, Fletchall says architecture wasn’t something that really grabbed him. He had no idea what he wanted to pursue until receiving a call from the College Board, a not-for-profit organization that prepares students for college success. One of the majors the counselor suggested was industrial design. When Fletchall researched the major, “it was like the heavens opened up and a light bulb came on,” he says. He came to Syracuse for the first time in the late summer of 2008 to begin VPA’s five-year industrial design program. He went on to become the Syracuse student chapter president of the Industrial Designers Society of America. As someone with interest and expertise in a wide, varied range of fields, Fletchall particularly enjoys two things—working with people and solving problems. As he continued through his course of study in industrial design, he came to a fork in the road in November 2011, after witnessing the mayhem of “Black Friday,” the busiest shopping day of the year. “It was very unsettling to me. I love design and believe it is an amazing, world-creating tool; I just didn’t know how I could continue to contribute to the commercial aspect of design,” he says. He learned more about and was intrigued by social design, particularly in design that improves a community and the well-being of its residents. For him, it was a perfect fit—design that is aimed at a bottom line of people, not profit. His work with Hartsock and the Connective Corridor has given him the opportunity to develop and launch community engagement projects that bring different groups together, and he has been part of a movement to change the way the younger generation sees the city. He’s worked with such groups as Syracuse Guru, No ExcusesSYR, Believe in Syracuse, 40 Below and the Syracuse New Times social media group to connect young professionals with SU students. Fletchall is on track to earn his master’s degree in communication and rhetorical studies from VPA in May 2015. He is not sure where the road following graduation will take him. He does know one thing though—he will be penning a love letter to Syracuse. See more news stories about Quinton’s work. By Marc Mason, a 2012–13 Imagining America Engagement Scholar. The Imagining America Engagement Scholars program supports undergraduate students after graduation to stay in Central New York and develop careers as civic professionals. Imagining America helps Scholars find jobs in the region and facilitates monthly seminars about the ethics of civic work. Additionally, Syracuse University’s deans provide tuition scholarships for the Scholars to take graduate-level courses. In its fifth year, the program has engaged 75 students. My past year as an Imagining America Engagement Scholar has been an amazing experience. Following graduation, I was provided with the unique opportunity to continue my studies at Syracuse University by enrolling in graduate level courses, develop my professional experience by working with the Near East Foundation (NEF), and expand my knowledge of civic engagement by participating in group discussions with my fellow Engagement Scholars. I always planned on matriculating into the Maxwell School of Citizenship and Public Affair’s MPA/MAIR joint degree program. The 24-credit tuition scholarship allows me to get the head start that I need to complete the program in two years and maintain a flexible schedule so that I can participate in extracurricular activities within a leadership capacity. Specifically, I completed coursework towards the Certificate of Advanced Study in Conflict Resolution. Through this program, I learned various communication theories and about interest-based negotiation, which will prove itself invaluable in both my professional and social spheres. Furthermore, I was able to work on projects that ranged from promoting reconciliation and collaboration between Israelis and Palestinians through the olive oil industry to improving resource management of Malian agriculture through the harnessing of non-conventional water sources. Lastly, my participation in the Engagement Scholars group meetings broadened my understanding of how my work fits into the concept of “engaged scholarship.” Through our group-member-led facilitations and discussions, I learned many things that challenged my preconceived notions about what it means to serve a community, whether it be domestic or abroad. I strongly recommend this program for any student who wants to expand and build upon their knowledge through practice and public service.